Papaya contains an enzyme, called papain, which is commonly sold as a dietary supplement. Some sources say papain can prevent or cure a variety of conditions, including gastric reflux, stomach ulcers and arthritis. There's no scientific evidence to support these claims, but if you have a stomach ulcer, you should seek medical treatment. There's a great deal of confusion in the general population about the use and utility of enzymes. Your body depends on proteins called enzymes to help regulate your chemical reactions. Enzymes also help speed up reactions that would otherwise take place too slowly to be of use to a biological system. One feature of enzymes is that they're very reaction-specific; if an enzyme regulates digestion of carbohydrates, it can't affect digestion of protein or fat -- nor can it take part in nondigestive reactions. Papaya enzyme, or papain, is a proteolytic. This means it digests other proteins, which explains its popularity as a meat tenderizer and ingredient in marinades. 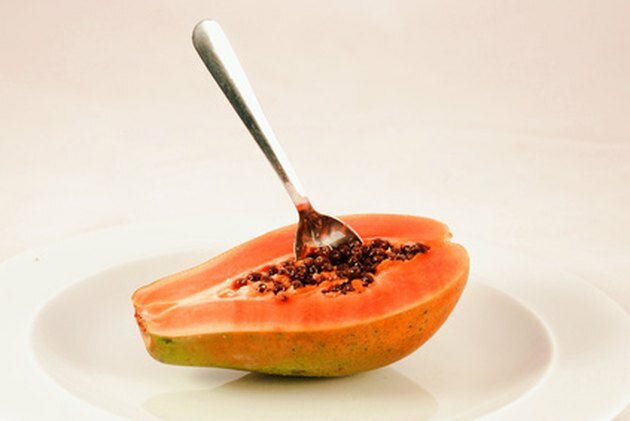 While some say papaya enzyme can help prevent or treat certain disorders, this isn't actually possible because papaya is a protein-digesting enzyme. Its only possible role in reactions is to digest protein. Stomach ulcers occur when the lining of the stomach becomes compromised, resulting in formation of an open sore. One of the most common causes of stomach ulcers is bacterial infection by Helicobacter pylori. Additionally, however, you can get ulcers if you routinely use certain analgesic medications, including aspirin. Finally, explains MayoClinic.com, some prescription medications can make you more susceptible to ulcers. None of these causes of ulcers can be prevented or treated with papaya enzyme, as none of them is alleviated through protein digestion. Rather than trying to use papaya enzyme to treat your stomach ulcer, see your doctor to discuss the cause of your ulcer and evaluate appropriate treatment methods. If you have a bacterial infection, you'll need antibiotics. If your ulcer is the result of medication, your doctor might be able to suggest an alternative, or might offer a prescription for a medication to help reduce acid production by the stomach, which can allow your ulcer to heal.